The most fascinating ‘hole in the ground’ in history. | What About Victoria? The most fascinating ‘hole in the ground’ in history. 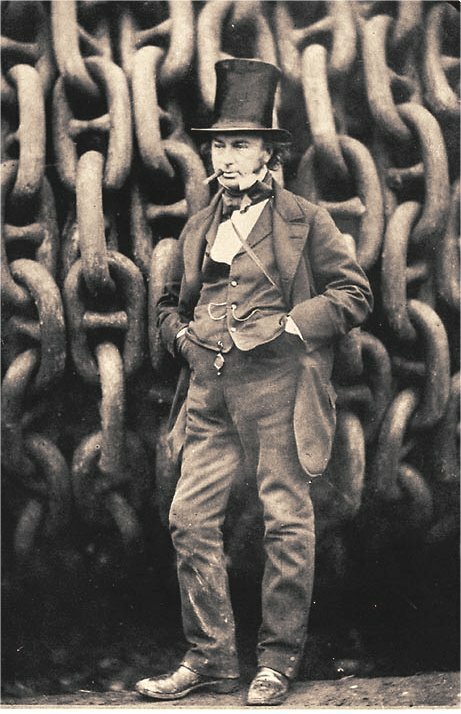 We spent Wednesday morning with Mr. Isambard Kingdom Brunel (1806–1859), one of the most ambitious and accomplished engineers (and cigar smokers) in the history of the British empire, on which, he pointed out, he had tremendous influence. We spent Wednesday afternoon with Mr. Robert Hulse (time–less), one of the most knowledgeable and charismatic tour guides (and wits) in the history of the British empire, on which, he pointed out, the sun never sets (because God doesn’t trust the British). To meet up with Mr. Hulse, we took the Tube to Rotherhithe, East London. After passing a decidedly dangerous-looking playground of sharp metal and rust, we took a left turn into a courtyard dotted with park benches that looked like various sorts of suspension bridges. Brunel designed bridges and ships alike, so we figured we’d found the right place. We had. The Brunel Museum is quaint and lived-in, so to speak, but quite well-done. Or, as my professors often say about quality museums, the place was quite ‘well-interpreted’. The place truly came to life, however, when Mr. Hulse greeted us–dress shirt with the button closest to his belt fashionably undone–and began straightaway to convince us that everything that is good and worthwhile in the world started right here, right where we were standing–in this complex of the original Thames tunnel Engine Room and, just below us, the Giant Hall Entrance to the Thames Tunnel. The entrance to the Thames tunnel, until a few months ago, hadn’t entertained visitors like us in the last 145 years, and so it wasn’t exactly used to company. We had to crawl through a tunnel and down stairs, treacherous as the playground we passed–appropriately, perhaps–to get into the most influential ‘hole in the ground’ in the history of mankind, perhaps even the history of the universe. Walking in the tunnel was a terrifying experience for many. Gift shops abounded, and the more souvenirs one bought, the braver one could be considered. Actually, there were fatal floods in the tunnel, so some of the fear was founded. You sat on three Brunel bridges, but the most important one is the transatlantic cable, which was laid by his ship, The Great Eastern. Only thing that would have made the tour better: Brunel-styled cigars for all.